The purpose, like many famous tourist landmarks, is to raise the perspective, in this case, of the single story dimension of the township to a vantage point where views such as Table Mountain, the Helderberg Mountains and a crows nest view of the Trojan Horse Memorial can be reached. The intention was by implication to raise the hopes or ambitions of the neighborhood. However, a public project of this magnitude is an ambitious vision when considered in relation to the community’s involvement, health and safety measures, structural engineering and finances. During the development of this work, I serendipitously came across the entire stock of the old Robben Island maximum-security fencing. The UNESCO World Heritage Site (1999) was being renovated, and the fencing was destined for a landfill in Vissershoek. 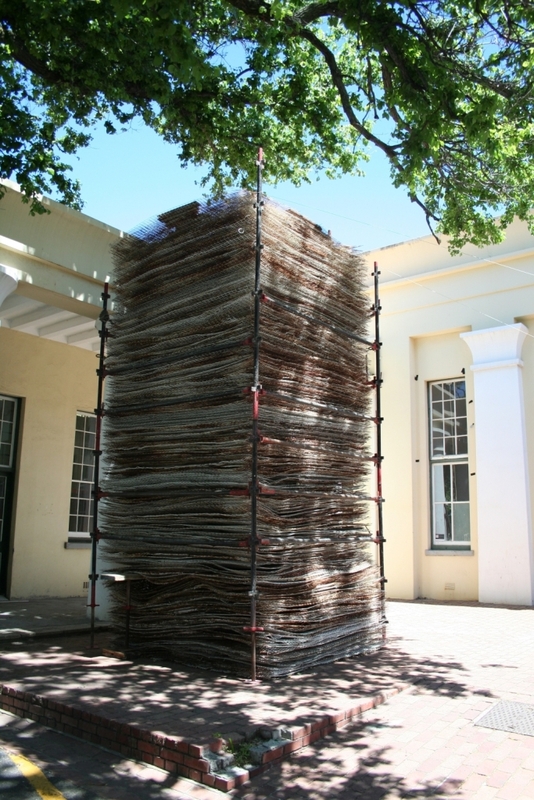 I would therefore like to submit a metaphorical variation of the intended ‘Aspire’ by the same title, except the Gateway to Robben Island version will be made out of a pile of 250 stacked 240 x 240cm sections of fencing. The form is based on the guard towers on Robben Island.